Marvel’s Agent Carter arrives amid the need for more female-centric storylines within the male-dominated Marvel Cinematic Universe. Hayley Atwell’s Agent Peggy Carter, previously seen in the two Captain America films, presents a strong, independent woman who fights tooth and nail for her country… even though her co-workers treat her as nothing more than a routine office worker. Season 1 of this TV show is a limited series, showcasing an eight-episode order, all airing during the winter hiatus of Marvel’s Agents of S.H.I.E.L.D. Set in 1946, there are secrets, scientists and ‘splosions galore. World War II has ended and Peggy Carter’s job status has changed a bit. Now working for the Strategic Scientific Reserve, she’s treated more like a secretary than the true secret agent she is. Even though she’s working for the U.S. government, the only person she truly trusts is Howard Stark’s butler, Edwin Jarvis, expertly portrayed by James D’Arcy. Together, the two become a formidable crime-fighting team. Their first mission: To clear Stark’s name. Stark Industries has been accused of selling weapons to enemy forces and Howard Stark has been framed for treason, before going missing during his Senate hearing. 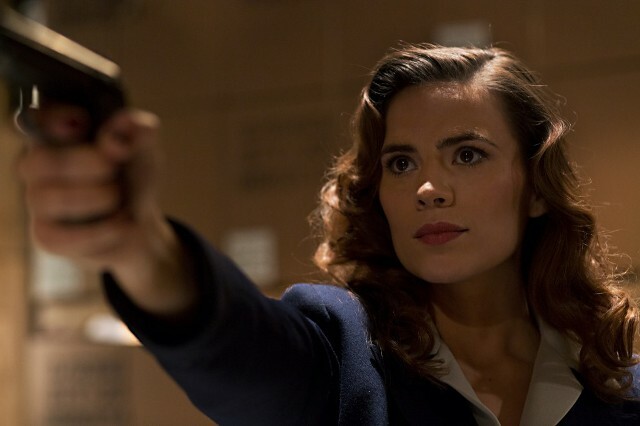 Most likely, Agent Carter will spend all eight episodes of the season exploring for information to be used to defend Stark. Being new to espionage, Jarvis provides excellent support, along with great comic relief. This series builds upon on her character and the pilot sets up great drama for future episodes. The Captain America Adventure Program is a hoot. Leviathan is the code name for this season’s main antagonist and Roxxon Oil is introduced, which excited me, since the corporation tends to be an ominous threat in so many Marvel comics titles. With great special effects and cool old-timey technology — including the awesomely creepy typewriter that’s used to reach out and touch someone — this show projects a fun, old-school James Bond feeling. I love the set designs and costumes, which actually feels like an authentic 1946. Everyone involved really did their research. According to Variety, the show’s two-hour premiere had a 1.9 rating/6 share in adults 18-49 and 6.7 million viewers overall. That means it outperformed most episodes of Agents of S.H.I.E.L.D. this year, however, it’s ratings weren’t much to write home about, placing second in its timeslot behind NCIS. As of now, its future seems iffy… unless the ratings improve dramatically. Looking ahead, we can’t wait to see Dum Dum Dugan and The Howling Commandos making cameo appearances. They were some of my favorite supporting characters of the Captain America films. But the one character I truly hope gets integrated into this TV series is Michael Douglas’ Hank Pym. It was no mistake the teaser trailer for Ant-Man premiered during the series’ premiere. All of us at Zombies In My Blog hope Pym gets to team up with Carter in future episodes. Maybe their adventures will be depicted via flashbacks next season? Strength: Carter’s a great character. Hoping she gets more time to shine. Weakness: Supporting male characters feel generic and disposable. WTF Moment: Dominic Cooper steals every scene as Stark. Is it too much to ask for him to be a series regular?